Badland formations occur when soft sedimentary rock is extensively eroded in a dry climate. Badlands are generally found in semiarid climates and characterized by gullies, steep ridges, and sparse vegetation. 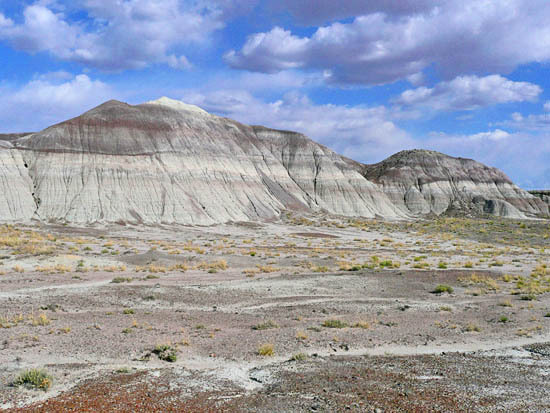 Badland topography is formed on poorly cemented sediments that have few deep-rooted plants because short, heavy showers sweep away surface soil and small plants. Depressions gradually deepen into gullies. The term badlands was first applied to the arid, dissected plateau region of SW South Dakota by Native Americans and fur trappers who found the area difficult to cross. South Dakota's Big Badlands, also known as the Badlands of the White River, are the world's best and most extensive example of this topography - exceeding 2000 square miles in area.